We were up at a reasonable hour to enjoy the breakfast; the croissants make you want to get going sooner. We asked at the desk about arranging a water taxi to the airport for Tuesday at 0530, and we also asked if they were still taking folks to the glass factory on Murano. I say factory for want of a better word because everything there is hand-made. The front desk said they had a water taxi to Fornace Venier scheduled for 1015, so we returned to the room, got ready, grabbed our things, and went downstairs to wait. Water taxi arrives 1015, and we loaded up along with a British couple and a French couple. We talked a little to the British folks, then Dianne offered to take a photo for the French. They warmed up and started chatting with us too. The British couple were on their first holiday together; ah, young love! At the glass factory, we were welcomed by Adrianno [ah-dree-ahn-o] and led into the workshop. The son and nephew of the two masters, also a master craftsman himself, was the same guy doing the demo that we saw in 2016. Because we visited on a Sunday, there were no other people working, and Adrianno told us that all of the pieces Il Maestro created today would be destroyed because the cool-down furnaces are not running. When we entered, Il Maestro was starting to work on a vase, one they call a tulip because of the shape of the opening. The furnace is at 1100C, and the artisans work without gloves so they can feel what the glass is doing on the end of their pipe. He rolled the glass for a bit, blew it into a rough shape, and rolled the hot glass of the soon-to-be vase in the glass chips from the 'tootsie rolls' they create. All the while, he would work the glass a bit, then re-fire it to keep it pliable and workable. He removed the piece from his first pipe, and attached a new pipe to the bottom of the vase, with help from one of the salesman. He re-heated the glass, then started twirling the pipe and then swinging it like a pendulum. The top of the vase opened like the petals on a tulip. The piece was starting to cool, and we could see the details and the cobalt color of the vase. He then took a strip of cloth, dropped it in the vase, and it ignited and burned. He wanted to show us that while it looked cool, it was still incredibly hot, around 800C. He did a second demo, making a horse. He did it in about four minutes; it was incredibly fast. From that point, Adrianno took us into the showroom to see all of the pieces they have available. We spent another hour, walking the showroom, asking questions, and all the while, Adrianno was sharing information, talking about the artists. He was very gracious, even knowing that what we were looking at was well outside of what we could afford. We ended up taking a small Venetian pink vase and green vase with us. They were smaller pieces, but they were pieces Dianne loved and they will be something that reminds us of this trip every time we look at them. We had planned to travel on over to Burano, but with the vases, we decided to take the complimentary water taxi back to San Marco. We rode back across the lagoon with a couple from California. In fact, she is the mayor of a small town near San Francisco, though I can't remember the name of the town. Her Honor gave me a business card that somehow did not make it home with us. It is the home of Sierra Nevada, and it was a small world kind of meeting since Sierra Nevada's east coast home is in our hometown. We talked a good bit with them about life, politics, beer, and wine, but mostly wine. When we disembarked at San Marco, Dianne and I decided to get some pizza at this place we had eaten in 2016, Pomodoro, that we remembered fondly. They were not open, so we hit the place across the alley from them. The pizza was good, and we shared a 375mL bottle of Valpolicella that we enjoyed with our pizzas. It was light and fruity, great acid, and a perfect wine to accompany the pizza. After lunch, we made our way back to the hotel via the Galleria Bridge over the Grand Canal. This was not the most direct route back, but it meant we avoided the crushing crowds in San Marco and around Rialto. We wandered the streets of Venice, working our way toward Galleria, enjoying the sights and the walk and the warm sun. It was a great way to spend a Sunday afternoon, taking in the essence of the city. 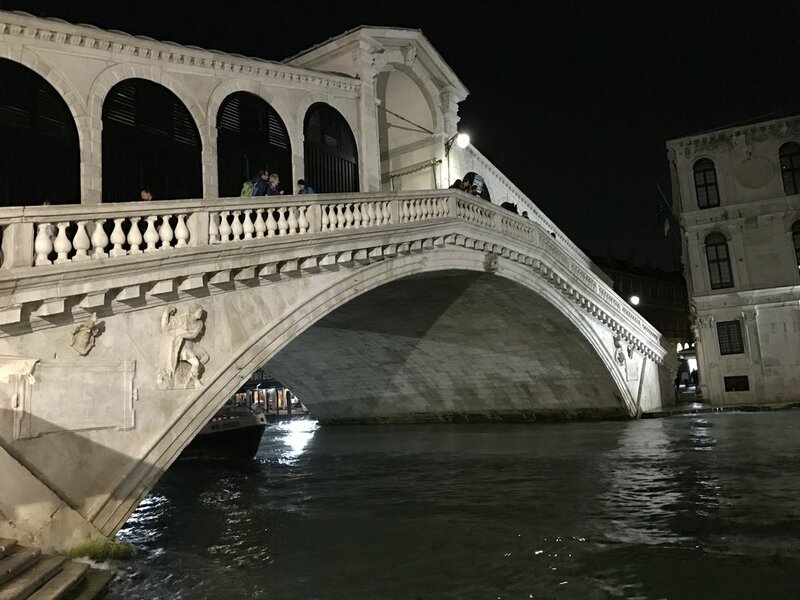 Love it or hate it, Venice has a way about her that is like no other place in the world, and it is fascinating to get away from the two popular locations and enjoy the less-traveled parts of Venice. Dianne had been wanting to see the Scuola di San Rocco, also known as the location of Tintoretto's Sistine Chapel. It was E10 entry, and I was feeling a bit arted-out after the afternoon in Correr so I sat this one out. I told Dianne to take her time and enjoy the space, I was enjoying the people-watching and sunny afternoon. I spent about 20 minutes waiting and watching, and suddenly, there was Dianne, pretty as a picture. I told her that I hoped she had not rushed for me, and she assured me she had spent exactly as much time studying the ceiling as she had wanted. We reached the hotel, and climbed the stairs to our attic room. We decided to take a little nap... Venice seems to do that to us, but it might be that we tend to end our trips in Venice, and we might run just a bit too hard with all of the sight-seeing and touring we do during the rest of the trip. With a little nap, we decided to find dinner. We had started to Vecio Fritolin earlier in the trip, and we just could not find it, but Dianne had had an epiphany during her nap. We were navigating toward Rialto in a slightly different path than we had on previous trips; we were making a cut across one of the minor canals one bridge sooner than we had before. We walked to the second bridge, crossed it, and there it was, just like Dianne remembered. We had a bottle of the Incrocio Manzoni 6.0.13 from Cecchetto. Incrocio means 'mixed' and Manzoni was the viticulturist who created the breed. 6.0.13 refers to the position in the vineyard of the mother vine [row 6, vine 0, trial 13], which was a cross between Riesling and Pinot Blanc. The sommelier explained all of this to us as he opened the bottle. The wine, as you would expect, has a really bright acidity and a nice crispy edge to it. The nose is green apple with a stone note. It may be my favorite dry white wine. We both started with a primi piatti; I had the pasta e fagioli, which the waiter told me was not the typical interpretation to which I said, "Even better. New experience!" Dianne had the Maltagliati al farro, a pasta. For the main course, we both had a fish dish. Dianne had the sea bass prepared four ways [deep fried, pan fried, poached, and roasted], and I had the red mullet. The pan fried version of the sea bass was the best of all of it, but it was all pretty good. For dessert, I had the biscotti e vino dolce and Dianne had biscotti all'olio, which had a really, really flavorful lemon sorbet as part of the dessert. The food was really good. We left there content and full, and made the 10 minute walk back to Giovanelli to get rested for our early start for a Palladio tour with Dottore Roberta Parlato on Monday. Monday 10 April was the last day of our trip. Up at 0630, ready by 0715, and breakfast eaten and out the door by 0730 for the 20 minute walk to the stazione ferroviaria, Venezia San Lucia, for the 0820 train to Vicenza. Boarded and outbound, Dianne and I marveled at how much easier it is to board a train without luggage. We arrived in Vicenza, made our way to the front loggia, and Roberta was waiting for us. She was enthusiastic, and ready to get started. We walked to her car, got in, and off we went. The drive to the first Palladian-designed home was about an hour away from the train station. We chatted, got to know each other a bit, and then she advised us on Palladio. The first stop was his first unassisted design project, Villa Goti. It lacks columns, something every other project Andrea Palladio designed. But the symmetry is there, with a large central entry room, flanked by four rooms of 'pleasing proportions' [either 2 x 3 or 3 x 5 ratios]. This particular four-room wing is also a departure from all of his other projects; the rest have three rooms: a small room, medium room, and large room that use the same proportionality. The frescoes are some of the most well preserved, and important components, of a Palladian design. They tell stories, usually from Greek and Roman mythology as well as stories from the Bible. Some are warnings, some are intended to demonstrate the homeowners virtue or power or his claim to honesty... Roberta said, "A man who is honest hardly needs to tell the world how honest he is, don't you think?" A very good point, I think. We stopped for lunch in Bassano del Grappa, where there is a Palladian designed bridge, the Ponte Vecchio. There were nine bridges built through the years in this location. The current bridge was rebuilt after WWII when it was destroyed by the Germans in an attempt to slow the advancing Allies. It is currently undergoing some renovation, but the bridge was originally built in 1589, rebuilt in 1748 and then again after WWII. Every version has been built according to Palladio's design. It is a truss system, built on piers that are turned in the direction of flow of the river. When it floods, when the mountains release a great torrent of water and debris, the bridge is able to withstand the assault because of the design. From Villa Goti we drove to Villa Emo. This estate is significantly bigger, but like Goti, it was built as a working farm. The home was for the landowner, someone who was wealthy but not insanely wealthy. They worked the farm alongside the peasants to bring in the harvest. The frescoes at Emo were really heavily focused on infidelity and what happens in mythology and in Bible stories to those who cheat. I first thought the lady of the home was sending a message to her husband, but as we talked more, it became clear it was the man making what I would say were threats to his wife about staying true. Our last stop was the Villa Cornaro in Piombino, a home that was built as a show-off piece for the wealthy Cornaro family from Venice. The frescoes in this villa, by contrast, were not contemporary to Palladio, so Roberta encouraged us to see them, but not to spend too much time focused on them, but instead to focus on the symmetry, the proportionality of the spaces. We spent some time enjoying the home and walking the smaller grounds. With a return train from Vicenza at 1826, we had to make our way back so we would not miss our ride. Back to the train station, we were there with about one minute to spare on the expected train departure, but the train was delayed five minutes, according to the marquee. It was really more like 10 minutes, but the train did arrive, going in the complete opposite direction that Dianne or I thought it should be pointed. We were a little nervous about boarding the wrong train, but all of the signs said that was the train that was in Bin 3. We took our seats and hoped for the best. And it was, indeed, the correct train. Thank God we did not end up in Milano. Back in Venice, we decided to go to da Bepi, our spot in 2007 and 2008, for dinner. Taking advantage of technology, we used Google Maps to guide us to the exact wrong da Bepi. Osteria da Bepi is about 20 minutes in the wrong direction from our intended target of Trattoria da Bepi. We were a bit disappointed at the extra work-out, but as Emilie shared the French saying, "If you don't have a head, you have to have legs." It is a parallel to "If you are going to be dumb, you better be tough." And on we walked. And walked. And walked. That was the longest 20 minutes ever, and the crowds just kept getting thicker and thicker. We finally made it to the intended da Bepi, and we walked in. Greeted by the owner with a hearty, "Buona sera", we returned the greeting, then said that we did not have a reservation, did he have room for two? He asked if we needed a hospital, a hotel, or what. We said, "no, just dinner" He said, "Then I have room for two! Come on in and eat!" Dinner was another fabulous memory. Dianne had scallops as an appetizer, while I started with a prima piatta of spaghetti in olive oil, garlic, and peperoncini, the Italian name for chili peppers. Both were delicious. I had the roasted monk fish for secondi, while Dianne had spaghetti with crab sauce. It must have been really good; I did not get a bite of that dish! For dessert, we finished with a tiramisu and biscotti e vino dolce. Back to Giovanelli at 2230, packed by midnight, and asleep for our 0430 wake up to get showered and ready to meet our water taxi at 0530. When we stopped by the desk to confirm the taxi, the attendant reminded us of that room tax that has to be paid in cash. Oh crap. Up to the room, and thankfully, Dianne had packed our ATM card. She went back out, grabbed an extra E60 to cover the room tax because we had to make withdrawals in E20 increments. At least that part was now covered. Very early morning on the Grand Canal. Ciao Italia, a presto. Early, early start to our travel day. We were up at 0430, showered, dressed, and downstairs at 0515 with the water taxi waiting for us. Took the 15 minute water taxi ride [most efficient route, but also the most expensive] to the airport, checked in and checked our bags, and walked to the gate. We passed through Italian immigration, passports stamped, and off we went. This was actually the first time I have gotten an Italian passport stamp; on every other trip, we have connected in Paris, and because the EU is 'borderless', our passports have all had French exit stamps. On this trip, we connected in London, and that has always required immigration crossing from the Continent to the UK. Flight left right on time, we arrived a couple of minutes early. Dianne and I passed through British security, and then headed to the British Airways lounge. Our wait was only a couple of hours, but the seats in the lounges are much more comfortable than seats at the gate so we took advantage of access. About 45 minutes before departure, we left the lounge and walked to the gate. Boarding was nearly complete, and we basically walked right on the nearly-full flight. It surprised me a bit to be that early to the gate and still be one of the last to board. The flight was almost exactly seven hours. Dianne and I watched a couple of movies [Bourne and Inferno], I wrote a little in my travel journal, and napped a little. Plus, British Airways kept us fed and hydrated the whole time, so when we deplaned at JFK, neither of us were hungry. It took us a little bit to go through US Customs because we were honest and said we had something to declare. The BA guy managing the line saw our US passports, looked at the form, then escorted us to the other line, the one that was actually moving. That speeded our process considerably, and by the time we reached the luggage carousel, bags were already circling. We claimed our checked luggage, and then walked it to the re-check desk. The lady there was very friendly, looked at the bag tags, and then directed me to place it on the belt. Dianne started to get a bag, and the lady stopped her, saying, "That is the man's job, honey. Let him do that! Us girls have to look out for each other." I laughed... and loaded the luggage as she requested. BA was not able to print our AA boarding passes, so we caught the Skytrain over to from Terminal 7 over to Terminal 8. We went to one of the self-service kiosks, and the system could not find our reservation. We went to the AA check in counter. Dianne had to guide me; I was having a hard time finding the correct line. Finally got up to the desk, and the lady helping us had a very hard time finding our reservation. It took nearly 30 minutes of click-click-click to get our boarding passes, but she was finally able to get them. On to our fourth security checkpoint in three airports, and then to the AA lounge near our gate. The third leg of our trip, from JFK to CLT, was not scheduled to leave until 1900, so we had a good long wait at JFK. We called everyone to let them know we were back in the US, and we had a drink and a snack in the lounge. About 1830, we decided to walk to the gate for boarding. And the flight was delayed more than 45 minutes, making our already-short connection in CLT really tight. We arrived in CLT at 2130, meaning the pilots made up some time in the air, and we were fine for our connection to AVL. By this point, we had been going without much sleep for 24 hours, and my eyes were so heavy I was struggling to keep them open. We walked to the gate for the flight to AVL, waited about 10 minutes, then boarding started. We boarded, sat down, and I slept on and off for the hour we were on the plane. Arrived AVL, claimed our bags, and Maleada was waiting outside to give us a ride home. We had a great trip; we can't wait to plan the next European adventure.